News, events and stories from the Prairie Fire Marathon. It’s amazing what can happen to a non-runner in just one year’s time! Meet Julie Reams. 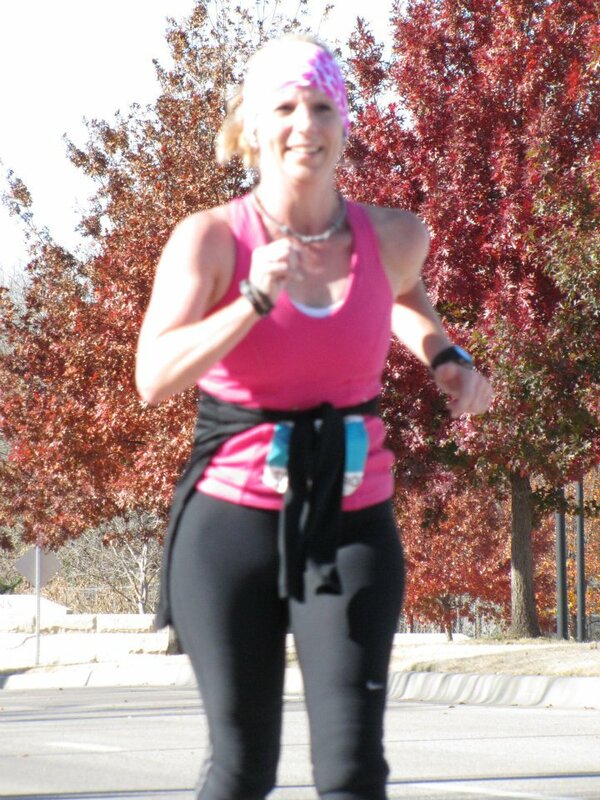 Hear how her journey went from one discouraging mile to more than she can count. Oh, and she was clear to state, she’s begun her Prairie Fire Training for 2012 too! “On June 18th of 2011, was my first day of traing at the First Gear Half and Full Marathon training. My neighbor had signed up for this course in May and encouraged me to do this with her, to run a half marathon, “how far?” I ask, “only 13.1 miles”. Yah right!! Well as time went on I began to think, that I was 39 and was going to turn 40 on October 31st and my 30′s were amazing. Started great and I wanted them to end great. So why not! I sent in my registration for and paid my fee. I saw my neighbor a few days later and told her that I had signed up for that running class. I had never run before in my life! Well the first day of class came and I showed up at 7am and knew right away I was pretty much out of my league. As we went around the room and introduced ourselves, everyone was saying how they wanted to run faster, running is what they do and they were all athletes! Man, I was totally out of my league. I had NEVER even ran a 5k, let alone couldn’t even tell you what it was. 5k? Never heard of it! 10k? Forget it! Was that around the block! It came my turn to introduce myself, I looked totally pathetic, shoes that were not even running shoes, and all eyes on me. I introduced myself and quietly said how I had never ran a race before in my life, never trained for anything and that the First Gear class was not like anything I had ever done before in my life. I explained that I wanted to get healthy because I was going to turn 40 and why not do something different. So after trying to run 1 mile at my first day of training, I got lost on the course, it was hot and I was so discouraged. But I knew if I was going to keep this up and run 13.1 miles, I had to practice, that’s what I did. I think my co-workers got tired of hearing me talk about running, but after awhile into training, every Monday they would want to know how far I ran that Saturday. Of course they thought I was crazy, still do! But they would shake their head after I told them that I ran 10 miles that past Saturday. I started getting up at 5am to beat the heat. Who knew that last summer would be the hottest in Kansas History and that I would choose to train for a half marathon, OUTSIDE! But I did. It was NOT easy. About 2 months before the Prairie Fire I hurt my knee, I thought it was broke, luckily it was nothing but IT Band issues and our couaches at First Gear, Gary Gregory and Raquel Stuckey, kept telling me it would all work itself out and just keep working at it. I cried so many tears, couldn’t walk because it hurt so bad. I went through so many different shoes trying to find the right one that would help me. Then at about 4 weeks out, I basically had to start all over with training. It was discouraging, but I did it. Just over a year ago, Julie didn’t own a pair of running shoes. Even though by the end of last year’s training I was exhausted, I was ready to run this race. Even with the rain on my first half marathon, I cried when I finished at 2:32:45. I hurt so bad when I crossed the line. I could not believe that I did it. One year has passed since my very first day of training, I have done over 30 5k’s, 4 10k’s, 2 half marathons, a 12 person team 200.5 mile Ragnar Realy in Arizona, trail runs, and many, many more. I have never figured up the actual miles I have ran, including training, but I know it’s a lot. « « It’s Not Too Late to Start- New Personal Training Programs Available for All Levels!